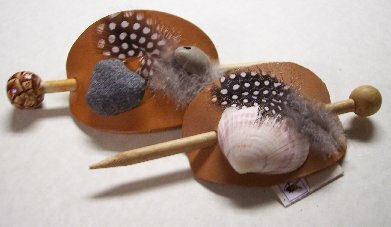 Multiple hair barrette and clip options are available here which are decorated with rocks, shells, and feathers. Some incorporate a handcrafted arrowhead made to your specifications. Remember that items with arrowheads may take a month before shipping. A Plastic, Metal or Wood Hair Stick with hanging beads are available here. Some have a feather, hematite arrowhead, or knapped arrowhead as an accent. Remember that items with arrowheads may take a month before shipping. 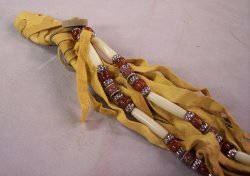 A variety of leather hair wraps are a unique offering of Phoenix Obsidian Designs. These are designed following a very traditional Native American method of hair decoration. 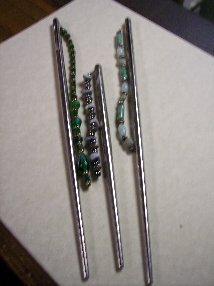 Also offered here are various beaded strands to tie over these hair wraps or to simply tie your hair in some other style. A variety of hat bands and hat clips are offered here to decorate your favorite hat.